He didn't mean for it to become a thing. Despite the fact that Adele's long-awaited new video is gorgeous, heartbreaking, and likely to make you cry in public, many people couldn't help but focus on her outdated flip phone. Is she one of those people who think smart phones rot your brain, or is she using a burner so whoever she's trying to reconnect with can't contact her again? According to a new People interview with "Hello" director Xavier Dolan, it's neither. "It makes me uncomfortable filming iPhones because I feel like I'm shooting an iPhone commercial," he explained. "On film, they're distracting to me. They're elements that you identify to our reality so much that—whether it's a short film, a film, a music video—they just hurt the piece's sensibility and reality, and it's not as romantic.​"
In the video, Adele is supposed to retreating from her life for a little while, and Xavier thought modern technology might make the clip seem too much like a boring old day-to-day. "You want to get out of your own life; you want to enter someone else's; you want to travel somewhere; you want to be told a story," he explained. 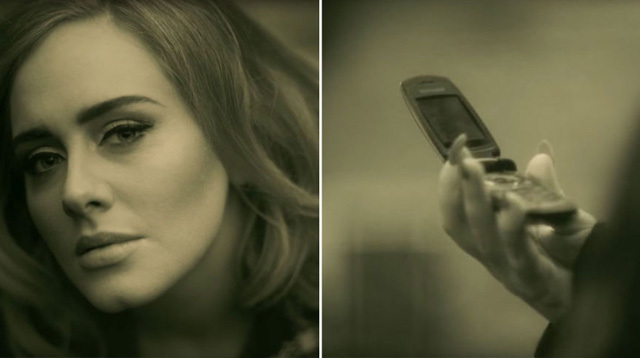 "I'm realizing maybe I've been more distracting than anything else with that flip phone, but it wasn't intentional!​" In conclusion, Adele can use whatever phone she wants to when she's calling you to get closure on your broken relationship.